I have just come back from a pretty special trip away. Following my Flow into 2018 retreat in Thailand, I took myself off for a little break to Bali. I had intentions to move around a little, to scope out different towns and beaches but when I arrived in Ubud I realised quite quickly that I wasn’t going to go anywhere else during this short trip! What I needed from my trip, whether or not I knew it, was not to try to cram in as much as possible or make the most of every possible yoga class, but to just BE. To wake up in the morning without agenda. To go to a yoga class because it was what I wanted in that moment rather than because it is what I should want to do as a yoga teacher lucky enough to be holidaying in Bali. I initially justified the trip as research for a future retreat, and I had plans to fill my time with filming flows in the jungle, doing 2 or 3 classes everyday and eating at all of the amazing restaurants and cafes lining every street. In reality, that would be taking the energy of London life with me, applying the same pressure to a different environment and giving myself different reasons to be just as burdened by ‘not enough time’ as I sometimes feel at home. Surely the best way to explore a new place is to just BE in it. I very quickly surrendered to this idea, and allowed it to guide me into a very content state very quickly! I hired a moped to give me freedom to travel round and commuted from my friends place in the rice fields to central Ubud a couple of times a day, as and when I chose. I realised that there weren’t going to be enough meals over my stay to eat everything, and I found myself not feeling that hungry, so I tried to tune in to what I wanted, when I wanted and reassured myself that there will always be another chance to try something. So the pressure around how to make the most of all of the incredible food offerings was gone. What about the yoga? Surely I should want to take 3 classes a day and make the most of the beautiful spaces and studios? Well yes, but I also wanted to explore the rest of the city too. And some days I took two classes, some days I didn’t take any. I still took 6 classes across the 4 days but rather than rushing to specific ones I let the weather and fate land me on the mat. When I passed a studio and a class was starting, I took it. If I was having to work up a sweat to get to class on time I let it go and stopped for a coffee in stead. No guilt or pressure. Just BEING. I’ve tried to keep up with what I ended up doing, although a lot of the time I just pottered around. I’ve realised that’s something that I like to do, just potter around a new place, without time constraint or specific agenda. It’s so much easier to live in the moment and appreciate what you find when you’re not trying to get anywhere in particular before a certain time. After arriving very late on Sunday night, I wasn’t sure if I would be up for lots of yoga in the morning. I had told my friend, Michaela, that I would like to come to her class if I was up to it and as it happened I got up in time by chance and made it to her first class. It was beautiful, and so I stayed on for her second, which I loved perhaps even more than the first. She teaches at Radiantly Alive and is a wonderful teacher. 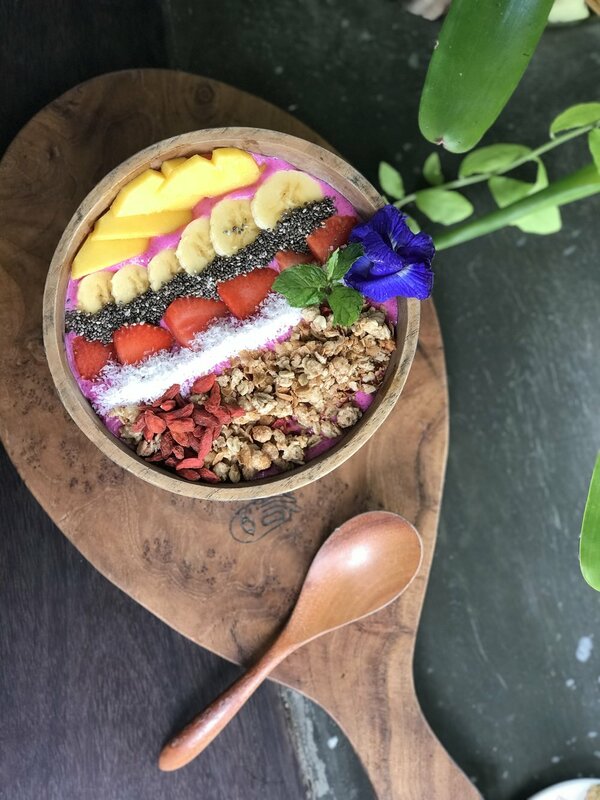 We then headed to her (and now mine too) favourite spot, Suyari, for a smoothie bowl before she headed off for meetings. You can choose your smoothies and topping of your choice. They also run cooking classes and courses which I would love to try on my next visit after sampling a few dishes from their menu. I hired my scooter from opposite Radiantly Alive Studio (50INR per day). If you are comfortable with driving a scooter I would definitely recommend it - it is such a convenient way to get around. I was excited to find a delicious coconut milk cappuccino (40INR) and picked up a side of vegan satay (tofu and tempeh sticks with peanut sauce) (10INR each). This was more of a bar vibe but worth a visit for the good coffee and delicious snack. I’ve been told the rest of the menu is very good too. I ended up locked out one afternoon so I decided to treat myself to a massage at a local spa. There are lots of them around, and massages are around 80-150INR for 60 mins traditional Balinese style. I would definitely recommend trying one! We drove through the monkey forest taking a shortcut through narrow back streets in the pouring rain. We arrived at Sage and I had a hard time choosing something to eat because it all sounded so good! I eventually decided to order the hula burger and a jamu shot, and we shared some tempura broccoli (they were out of the usual cauliflower) which was delicious. It was a total dream, deliciously indulgent but so fresh! (Dinner and juice for 3 was 340INR). I was marathon training during my trip so I set out really early to beat the heat as much as possible! My friend came with me and we looped around the rice fields, which was a really great way to see some of the more rural parts of Ubud, surrounded by jungle and temples! After my yoga practices the day before and run in the morning, I was feeling more into yin energy today. I considered a yin class but landed myself at roll & release, a myofascial release guided self-massage class using mobility balls. I figured it was a good practice to take home for the rest of my training if nothing else. It was actually really good, and was the first step to guiding me towards more mobility work during the rest of my stay! After 10 days of being away, I noticed my skin wasn’t loving the humidity so I went to Fresh for a facial. It was a little more expensive than others that I had seen elsewhere but I wanted to treat myself and to hopefully ensure it was really good! It lasted 90 mins and my understanding was that it was all natural although I have a feeling one or two things weren’t. Either way, I felt very relaxed and my skin felt great after! I was dying to try some local food – I was in Bali 9 years ago and still dream of the Nasi Goreng that we ate then. Traditionally made with egg, I wasn’t sure how easily it would be to find vegan options. To my surprise, local restaurants were incredibly accommodating with vegan and vegetarian options available in many of the restaurants. This tiny place has just a couple of tables looking out on to the street. Vegan and non-vegan Indonesian dishes for 25 INR. I also picked up a pumpkin cake, a sort of sponge with a claggy texture wrapped in banana leaf. It reminded me a lot of a sweet potato brownie, just without the cacao. It was slightly strange but I loved it! The creamiest smoothies bowl I think I’ve ever eaten and a delicious coconut coffee on the side, the Dragon Bowl Z was basically like desert for breakfast. I sat with my book looking out onto the street (just next door to where I had eaten the night before). A big café with a varied menu suitable for vegans and meat eaters alike. It wasn’t the most exciting dish I had but the falafel was really good and I enjoyed the big bowl of veggies. Being rainy season, I wasn’t counting on making use of the pool but I was lucky enough to have a few hours of clear skies. I thought I would make the most of it and have some time reading my book by the pool and taking in the beautiful view there. The pool is open to hotel guests only, just one of the reasons to stay! While Ubud is super chilled, it can be quite noisy so having this little oasis was really special. The hotel breakfast was great, and really accommodating. I finally had nasi goring and even without the egg is was just like I remembered! It was served with tempeh and tofu skewers and I had another delicious coconut cappuccino! I had to do some marathon training in the morning so made use of the hotel gym and a good breakfast afterwards was very, very welcome. I loved the classes at RA but thought I should give The Yoga Barn a try after so many people recommended it to me. The class size was MUCH bigger and the space was pretty cool. Definitely worth checking out, and next time I would like to get to more classes to explore different teachers. The café is meant to be good there too, but I opted for dinner at the hotel. After enjoying the roll & release class earlier in the week, I decided to go back for another class with James. This was a very similar style to the Yin Yang class the night before, focusing on elastic movement to create space, then gliding movements before moving into a more yin style part of the class. I waited my whole trip for this and was not disappointed! I don’t think I was hungry but I was desperate to give it a try. Made of coconut and with flavours like jamu (turmeric and ginger) and anahata (cardamom and ginger_ all made from coconut in a gluten free waffle cone, it was a perfect treat after class. I was trying my best not to shop while there, despite the desire to replace my whole kitchen with gorgeous Balinese wooden bowls etc – I will definitely do that next time! I did take time to wander the market though to get an idea of the local crafts, to support the stall holders with small purchases and soak up some last bits of culture before leaving. It is next to the Ubud Palace, which I didn’t explore properly, but perhaps a good few hours could be spent between the tro. Support a gorgeous ethical, local start up, Studio Kolektif. Their clothes are gorgeous, made with sustainable fabrics, dyed and produced in Bali. They have an online shop but while you are there you might as well save the earth a little more by buying from a store in stead of ordering online. Sometimes when you are away, clothes look amazing and then you get back home and realise they're not as great as you thought they were on the beach! This is the opposite, no matter where you are in the world! The quality is amazing and their designs are classy, comfortable and timeless.